Cleft palates and cleft lips are physical defects that are usually inherited from a puppy‘s parents. In a handful of cases these conditions can be caused by dietary deficiencies or exposure to chemicals while in utero. Whatever the cause, these conditions can be considered “birth defects” of the puppy world. What are cleft palates and cleft lips? A cleft palate is a gap in the roof of a puppy’s mouth. 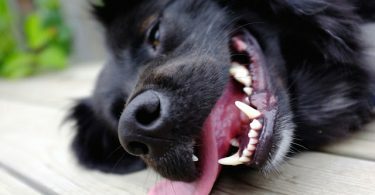 The gap often leaves a space open between the dog’s airways and the mouth. A cleft lip is a gap in the line of a puppy’s lips. 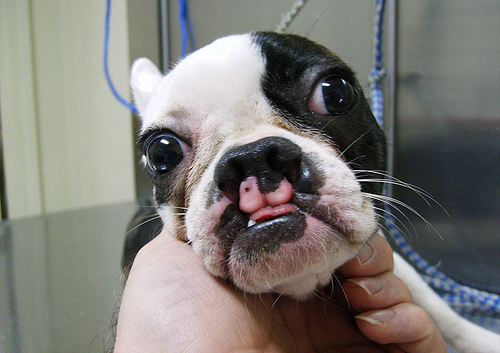 A cleft palate is visible if you are looking at the roof (hard palate) of a dogs mouth. It will look like a split in the middle of the hard palate. A cleft lip looks like a split or indentation in the lip extending up to the nose. Milk running out of the nose (caused by milk being drawn up through the cleft into the airway). These conditions are more common in certain breeds including: Beagles,Bernese Mountain Dogs, Boston Terriers, Bull Terriers, Chihuahuas,Cocker Spaniels, Dachshunds, English Bulldogs, German Shepherds,Labrador Retrievers, Pekingese, Miniature Schnauzers and Shetland Sheepdogs and Shih Tzus. Dogs with Brachycephalic builds (short muzzled breeds) can have a 30% risk for these defects. A puppy with a cleft palate will need round the clock care and assistance as it will not be able to feed on its own. Often the caretaker will need to be taught how to tube feed the puppy by their veterinarian. This process must be done correctly as many dogs with these conditions suffer from Pneumonia due to aspiration of food. Antibiotics are sometimes given to combat respiratory infections that can trouble a puppy’s fragile system. 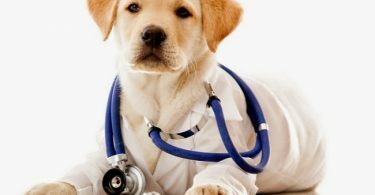 In the case of minor defects, once the puppy reaches a stable weight (around 6-8 weeks of age), a corrective surgery can be preformed to close the gap. The dog should be spayed or neutered to prevent passing this defect on. In the case of severe defects, euthanasia must be considered as they are almost impossible to repair effectively. How dangerous is chocolate for dogs really? First aid for dogs: Why does my dog ​​eat grass? Dog Eye Issues – What is Entropion? hi, I am a cleft lip and palate surgeon based in Pune. 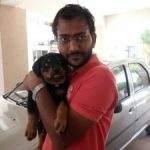 I would love to help you for the surgery if possible long with vet. Is any vet surgeon in India doing such cases ?